This new Nike Air Twilight Men's Shoe is the workhorse of the action sports family, that has true skater-style with technology to keep your feet supported and comfortable. 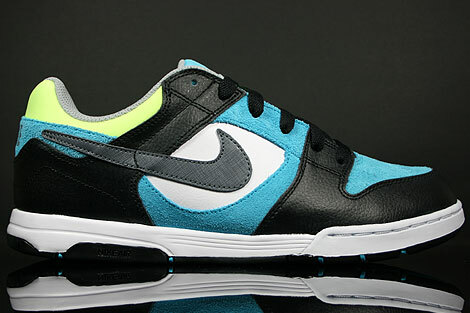 With black and white leather comes the Nike Air Twilight, chlorine blue suede parts, also on the tongue. Highlight will be the neon yellow nylon fabric at the heel area, grey mesh inner lining and the light blue/black outsole. Features full-length Phylon midsole for cushioning, an encapsulated Air-Sole unit in the heel for impact absorption, a forefoot cupsole with stitching for increased durability and the classic Nike Signature plus/minus tread pattern at outsole for maximum traction.